Founder and CEO Dean White, P.Eng, didn’t know he was meant to be an engineer until he was in university. He was originally enrolled in sciences, but when a friend asked for help with an engineering project, Dean was inspired. He discovered his life’s passion. Engineering was fun, challenging and it constantly pushed his boundaries. 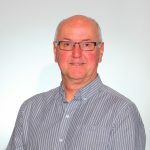 Dean graduated with an engineering degree from the University of Calgary and has been a member of the Association of Professional Engineers of Alberta (APEGA) since 1982. His career has taken him literally around the world, from the North Sea to Nigeria, from Alberta’s Oil Patch to the Arctic. He has worked on telecommunication and navigation systems around the world, military projects and CATV networks here in Canada. In addition, Dean is an inventor. He holds a patent for an low profile wind wind turbine. After a successful career as a professional engineer, Dean decided to create a learning centre where students could learn about engineering and technology long before they leave high school in a hands-on environment. With his colleagues, he builds programs for grades one through twelve, homeschool students and college interns, based on STEM+A (science, technology, engineering, math, plus the arts) curricula.